I was nominated by the lovely Beth at Perpetual Style, for another award this week! This time its the Versatile Blogger award :) I love being nominated for these awards, it really makes all the effort I put into my blog worth it, knowing that someone enjoys my content. So thank you to Beth for nominating me, go check out her blog! 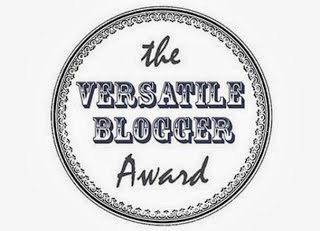 So what is The Versatile Blogger Award? Well it's award given to bloggers who inspire you and bring something special to you! This could be due to their posts, pictures, tips or just their writing skills. 1. I am a massive book worm, I love to read! I love that a book can take you into your own little world, and while your reading it you feel like your inside the story. 2. I'm 5"10' .... very tall!! I'm still learning to love it, which can be very difficult when you feel like the BFG when you wear huge heels. Go check out their blogs as well as Beths! well done on the award lovely! I have never seen the award before but looks great! I was the same at school tearing out pages! I still do it to! This post made us smile :-) Points 6 and 7 - completely agree with you!